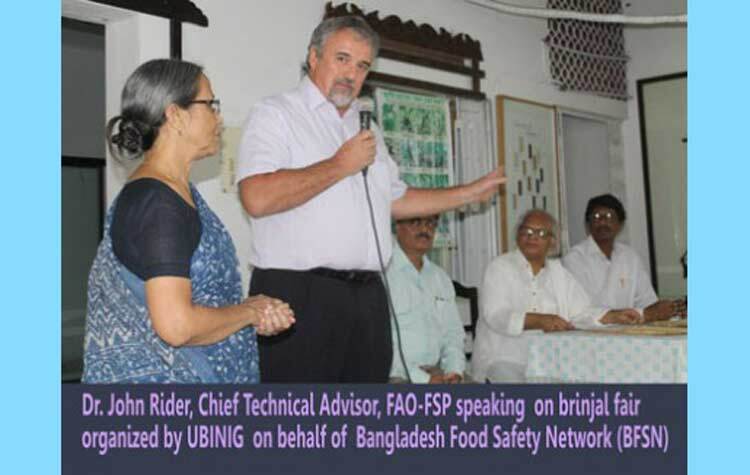 A brinjal fair was organized by UBINIG on behalf of Bangladesh Food Safety Network (BFSN) under the aegis of Food and Agriculture Organization's Food Safety Project (FAO-FSP). The brinjal fair was held at Prabartana, 6/8 Sir Syed Road, Moahammadpur, Dhaka on 15 June 2015. The fair was started at 10 am and continued up to 8 pm. About 500 visitors attended the fair in the morning and attended the discussions session. More than thousand visistors visited the fair and was surprised to see so many varieties of brinjals in Bangladesh.This was the first such fair to educate the consumers that safe brinjals are avavilable and by supporting farmers who produce food without hazardous chemicals and pesticide they can ensure a steady supply of this wonderful vegetable they love. Brinjal is a popular vegetable in Bangladesh. It is cultivated all over the country round the year. However, brinjal yields better in the winter season. Bangladesh is the center of origin of brinjal. Varieties of brinjal are cultivated in different types of land. Nearly 248 varieties are officially acknowledged, although diversity is higher than officially known. Varieties of brinjals are appreciated for size, shape, color and taste and some are famous for their culinery delicacy. Brinjal is a member of Solanaceae family. Close relatives of brinjal include potato, tomato, chili and tobacco. Bangladesh is the origin of diversity of brinjals. Some of the famous varieties are shown here from the Brinjal Festival. Nevertheless, there are two major concerns. The first is developing a marketing chain that could ensure a supply chain to consumers. There is an abundance in local varietis, but because of inefficient marketing farmers can not fetch the economic benefit from brinjal. Second issue is safety. Some farmers use very high amount of pesticides, an issue for the consumers. These are examples of challenges the Bangladesh Food Safety Network (BFSN) faces while working for ensuring safe food for the people with the support from Food and Agriculture Organization's Food Safety Project. With a view to ensuring safe food, UBINIG on behalf of BFSN has been collaborating with the Delduar upazila of Tangail. In the Dhaka Divisional Workshop of BFSN, the Delduar upazila Chairman S. M. Ferdouse proposed for declaration of Delduar upazila as a model for safe food. This was also a recognition of the activities of Nayakrishi farmers, who are practicing biodiversity-based ecological agriculture in different Upazillas of Tangail, including Delduar. They also declared support and collaboration with Delduar Upazilla Parishod. UBINIG is active in agriculture, health and other community activities in the area. The organisation's role in safe food production and distribution through Shashyaprabartana will add powerful lead and momentum to realize the promise of Upazilla Chairman S.M.Ferdous. Nayakrishi have been producing diversified crops without using pesticides and chemical fertilizers. Demonstrating a successful Upazilla model for the production of safe food and linking them with conscious urban consumers through Shashyaprabartana is strategically important and significant. Success will definitely be a mighty step forward for BFSN's mission, impacting on consumer's awareness and national policy. Consequently this will strengthen FAOs role in ensuring safe food in Bangladesh. The farmers in Delduar upazila have been growing varieties of crops including rice, wheat, minor cereals, pulse, oil seeds, spices, and vegetables. Brinjal is one of the most common vegetables. The farmers of Delduar upazila have been growing 27 varieties of local brinjal. The major ones included Jasori begun, Tabla kalo begun, Nil begun, Singnath begun, Shaila begun, Dohajari begun, Besuri lamba begun, Chikon lamba begun, Chega begun, Harsita begun, Islampuri begun, Islampuri saira begun, Islampuri sada begun, Kata begun, Nittapeshi begun, Uttara begun, Dim begun etc. (See more here). A discussion session on brinjal was held. Dr. John Rider, Chief Technical Advisor, FAO-FSP, Dr. Rokeya Khanam, National Advisor, FAO-FSP; SM Ferdouse, Upazila Chairman, Delduar; Hasan Ahmmed Chowdhury, National Advisor, FAO, Food safety management system, Mohidul Hoque Khan, Member steering committee; BFSN, Zahid Hosan, BAPA; Farhad Mazhar, Managing Director, UBINIG; Farida Akhter, Executive Director, UBINIG; Dr. M. A. Sobhan, Consultant, UBINIG participated in the discussion session. The speakers highlighted the importance of safe and nutritious food. The art and science of producing, processing, distributing and marketing of safe food was discussed. Brinjal was mentioned as a wonderful vegetable for rich source of vitamins and minerals. The safe method of production was prioritized for availing the nutrient value of brinjal. Akkas Ali, Nobokumar, Amir and others from Nayakrishi and Nabapran Andolon rendred songs highlighting the importance of safe food. 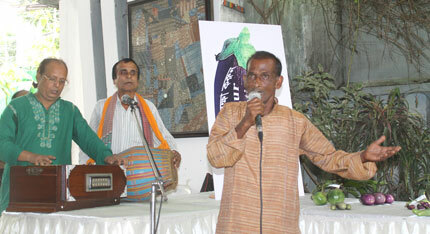 Akkas Ali presented his famous song on brinjal. Nabakumar sang on the struggle of farmer for safe food. Most of the songs are composed by the Nayakrishi farmers on their practice and experience of biodiversity based ecological agriculture. The event started with song and continued up to 8 pm in the evening . The visitors included men, women, students, journalists, teachers, consumers and children. The visitors came in a festive mood to see the demonstration of varieties of brinjal and listen to the songs mainly on brinjal. Varieties of recipes of brinjals were also prepared and put on display. S. M. Ferdouse, Upazila Chairman, Delduar said, that he has been working with the farmers for safe production of vegetables, lemon and banana. The farmers have been growing these items with large quantities for own consumption as well as marketing in local market and outside. He also expressed the potential of these items for export outside the country. The importance of safe food was also discussed in the regular monthly meeting of the upazila administration. Public awareness was created in the union and village levels in favor of production and use of safe food. Finally he wished the initiative of safe food as implemented in a joint effort of UBINIG, FAO-FSP and Delduar upazila parishod will be successful and established as a model for extension in other regions of Bangladesh.